As you could see our family budget figures for the last 7 years are distinctly split into two periods: 2007-2011 and 2011-2015. The main reason is that we moved to a different area, where the cost of living is significantly higher in all possible respects. With more information gathered it is interesting to look at difference not only from the last year but from average value as well. Our main savings from last year where on dentist which is not covered by insurance, less gasoline for the car, no major furniture for the house and significantly less on travel (we went twice on vacation last year – locally and abroad). This year due to the work load it was not possible, so the expense happened in October 2015. Quite educating to look at average figures, which was only $6K USD different from average (this is not visible, as dollar is much stronger, so it appears that we spent less US last year in comparison with average). We spent less money due to the deferred vacation but compensated it with more money on education for the kids. This is easy to explain - one child left nursery and went to school, the other one was born and did not go to nursery. That disturbed average figure. - Educational expenses would stay the same as this year. - Joy would be above average, unless deferred again. - Rent to go up by at least $1,500 a year (This could balloon quite significantly if we decided to buy a house). 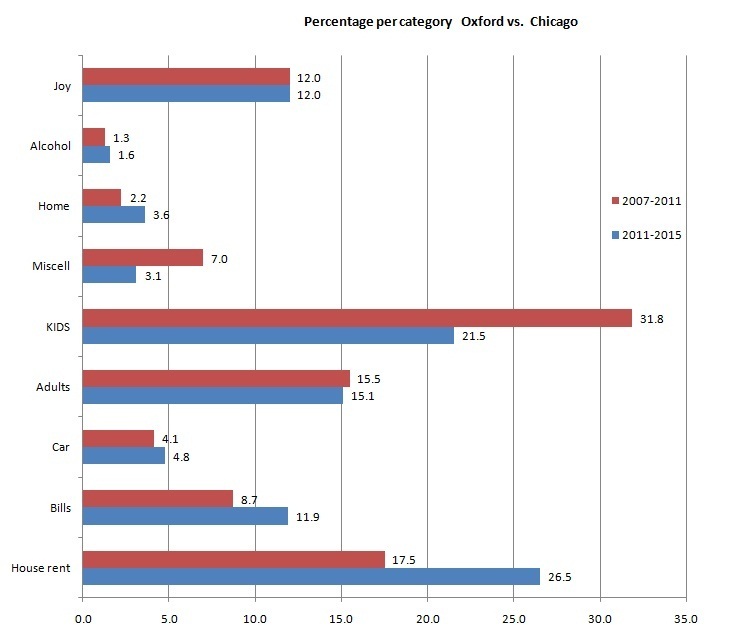 There is one distinct difference between Oxford and Chicago - percentage of budget house rent and bills are significantly higher than in Chicago, while cost of the child care is significantly less. It is bad news if you decide to stay in Oxford for long, as eventually kids will go to school, while need for house and paying bills will stay. Saying that Oxford is considered to be the least affordable city in the UK to live in, average annual salary vs. house is times 16. That is why not having affordable housing is bad for the economy, in Chicago with more money left on our hands we spent them on miscellaneous items and this would only go higher, once kids are in school. On in all I kept my last year intention to stay under $100,000 for our expenses even at last year exchange rate, when the dollar was much weaker. Plan for the next year? Stay the same – under $100,000. On the other hand you could tell, if not for the kids our budget would be ~ $27 K US less, should we own a house another ~ $23 K US is gone. We are only need ~$40-50 K US for our financial independence and freedom a year once kids are out of the house and into the open world. For sure we could trim further if required but it is off the point. I invite all to keep budget on the way to financial independence and share true story, as it is quite fascinating reading.